The Apple Certified Technical Coordinator (ACTC) 10.10 Boot Camp is a combined delivery of the Yosemite 101 and Yosemite 201 courses and associated certification exams. 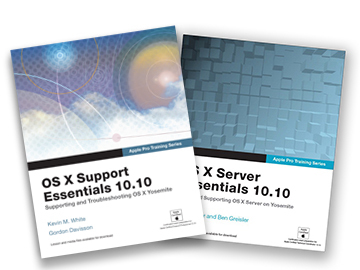 This hands-on course provides an in-depth exploration of functionality and troubleshooting in OS X and the best methods for effectively supporting users of OS X systems. This course is a compressed delivery of 2 courses, and should be attended only by those who are already familiar with the concepts and comfortable working at a quick pace. ACTC Bootcamp is designed for help desk specialists, technical coordinators, service technicians, and entry-level system administrators who implement and maintain networks using OS X Server or support Mac users, technical support personnel in businesses that use Mac computers for general productivity or creative design, and technical coordinators or power users who manage networks of computers running OS X — such as teachers and technology specialists who manage classroom networks or computer labs. • Refer to the Yosemite 101 and Yosemite 201 course outlines.